A profile of Chrishinze.nl was found on the social network Twitter. The web server with the IP-address 46.235.40.12 used by Chrishinze.nl is run by NetBase BV and is located in Netherlands. This web server runs 2 other websites, their language is mostly english. 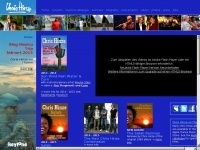 The websites of Chrishinze.nl are served by a Apache web server using the operating system Cent OS (Linux). The software used to serve the webpages was created by using the programming language PHP. HTML 4.01 Frameset is used as markup language on the webpages. To analyze the visitors, the websites uses the analysis software StatCounter. Due to the use of frames and framesets the visibility in search engine results may be affected negatively. The website does not specify details about the inclusion of its content in search engines. For this reason the content will be included by search engines. Visitor Tracking/analysis: The website uses StatCounter to analyze the visitors.